“The boat is a tank,” says Captain Jeffrey Callahan with the broad smile a proud father may have after witnessing his kid’s first home run. Standing on the bridge of 31.3 metres Northland, in a sun-drenched Florida marina, he recalls a day when the weather was far less serene. As Northland’s build captain, he moved to the city of Manitowoc, Wisconsin, home of the Burger Boat Company, and lived there for about two years. He enjoyed his time there but by November 2017 he was itching to leave before the weather made it impossible to fulfill the owner’s plan to spend part of winter 2018 in the Bahamas trolling for fish. He should know. He has worked with the yacht’s owner for nine years, and after being his eyes and ears during construction, he returned as the new Northland’s captain and engineer. Since these trials many months ago, the boat has covered a lot of territory – Manitowoc to Florida, the Bahamas, up to Washington DC, Newport, Nantucket, Martha’s Vineyard, Maine, Halifax, Nova Scotia and back to Florida. Northland had what amounts to a 7,200-nautical-mile shakedown cruise. By early January, she was on her way to Papeete in the South Pacific’s French Polynesia. In this way and more, Northland is a bit of an outlier. The yacht’s owner had a 24.3 metre Hatteras motor yacht for years and although he loves fishing, he wanted his next boat to be capable of taking him farther and did not care much about speed. 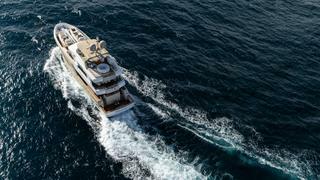 With her strong appearance, high freeboard, a 4,000-nautical-mile range, a large fishing cockpit and outriggers, Northland is what the yacht’s designer, Luiz de Basto, calls “a hybrid design.” This is not because she is fuel efficient (powered with 475hp Caterpillar C18 engines), but because she is the offspring of two families of yachts. The owner knows about fishing and construction and was involved from the beginning. “It is one of those clients who feels very much in charge of the boat,” de Basto says. “What we created was in some way a vehicle for him to realise his wishes.” However, “he also wanted to be surprised and he was challenging us to propose different things.” From the first design, de Basto ventured to a boat that was “a little bigger and a little more modern” than the initial concept, both inside and out. Northland looks like an explorer from many angles, but one with a contemporary twist, including large windows on the main and upper decks where the owner’s suite is located. 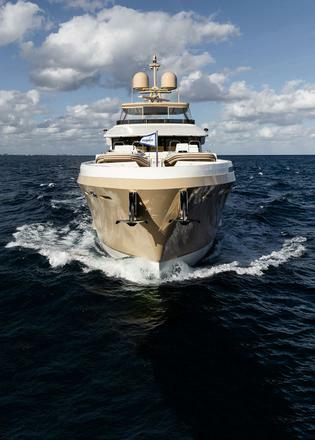 Adding to the yacht’s original looks is the hull colour, which matches the mast, a finish by Awlgrip called Desert Sand. 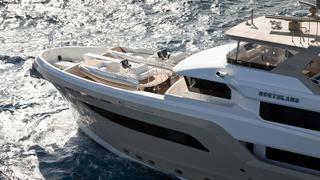 De Basto was keen on highlighting the hull shape, but the owner did not want anything typical, like blue or grey. “We did a number of studies and this was one of the colours the owner liked,” the designer says. Painting samples on large panels helped seal the deal. It is a discreet colour but a standout as well, which makes the yacht easy to recognise in a sea of similar-looking vessels. A number of musts dictated the design: an owner’s suite on the bridge deck; a large flybridge to compensate for the fact that the entire stern is dedicated to a large fishing cockpit; and two expedition tenders that needed to be accommodated on the foredeck. 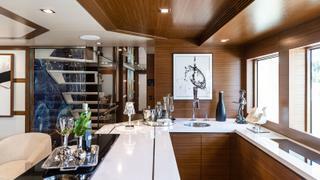 “This is basically how the design was born,” says de Basto, who together with his wife and VP of De Basto Designs, Cristina de Basto, created a comfortable interior with the feel of a home on the water. Although it is a fairly common practice in the realm of superyachts, it is far rarer in this size range for a client to develop a pure custom design and then submit it to various shipyards for bids, but that is how Northland came to be. Once the design was set, the captain developed an extensive list of specifications. 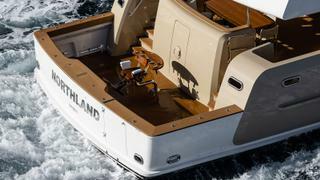 He worked closely with Yachtronics of Fort Lauderdale to select the navigation and communication equipment. Everything is redundant to make it practical and safe for the small crew to handle the boat on long passages or while fishing. Although intended for private use, Northland is built to ABS class, which mandated a number of systems and a few design tweaks – all copper piping, for instance, sealed steel compartments for the stabilisers and an 1MC public address system, just like on a cruise ship, among them. “We submitted our specs to Patton Marine and then we sent them to a number of yards to get some feedback.” Eventually, among the builders, including a couple in Europe, the owner’s team selected the Burger Boat Company. “We wanted that logo,” the captain says, “and they built a heck of a boat.” It was also a more manageable choice for the yacht’s owner, who could drive or fly to the shipyard easily and did so frequently. This was a welcome addition to the Burger fleet and the first large yacht since the 2010 delivery of 42.6 metres Lady Gayle Marie when the yard reintroduced commercial construction. Since 2011, Burger has delivered five new commercial projects between 18.8 metres and 29.8 metres in length in steel and aluminium and carried out refit and repair services on dozens of other vessels. The interior of Northland is on the contemporary end but comfortably so, with muted colours from taupe, chocolate brown, greys to off-whites with dark blues and mauve accents. 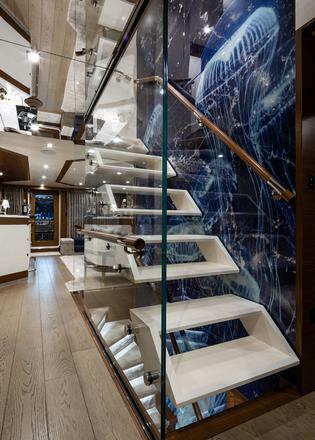 An eye-catching feature on the main deck, which is dedicated to dining and entertainment, is a staircase flanked on one side by glass and on the other by a blue panel of jellyfish, the work of artist Alex Turco. 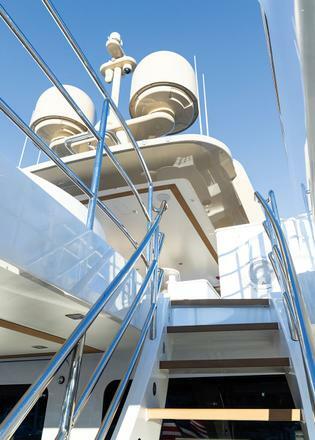 The steps look suspended in midair but are perfectly comfortable to climb to the bridge deck and the owner’s private aerie or to descend to the guest cabins on the lower deck. For the bulkheads and cabinets, the de Bastos used a selection of veneers from Tabu, a light hued tay koto and, for contrast, a darker, more textured Carbalho “Matching the grain was no easy task,” recalls Captain Callahan, who watched the craftsmen work on aligning the patterns. “I tell you, the Burger craftsmen highly impressed. They take a lot of pride in their work,” he says. “Gene [Gauthier], who heads the joinery department, is an absolute genius.” Gauthier has been at Burger almost 40 years and is not an outlier there. Building boats at Burger is a bit of a family tradition, according to Ruffolo. The flooring is wood except for a few area rugs and sound-dampening carpets in the guest cabins. It looks great, but the selection was about more than looks. “The idea was to make the interior comfortable, yes, but also to make it practical and not too sophisticated. It’s a fishing boat and one that is going to be used. The main deck is for the salon, dining room, library, galley and bar,” de Basto says. The owner wanted to make the main deck a social area where people could feel at ease and not worry about damaging delicate carpets. From the aft deck and cockpit and through the salon doors, the first indoor space is a lounge with an attractive bar clad in upholstered panels. “The bar is a completely wet area, so that it can be used and cleaned easily,” the designer says. Another great space is forward on the main deck, where the master stateroom can usually be found. On Northland, the room is a library/television room with a Crestron system and surround sound. 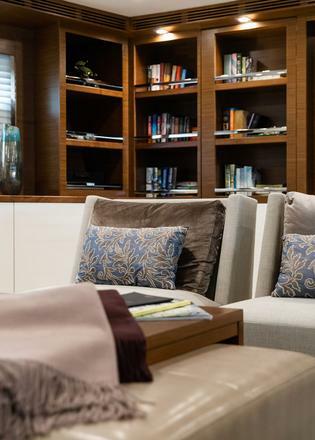 Facing a comfortable couch are club chairs from Christian Liaigre and shelves lined with many books. To fit all the wiring and the racks to support the entertainment system, de Basto exploited a narrow space near the bow, hidden behind the bookcase lining the wall. Nearly impossible to detect within the bookcase are doors with beautifully made hinges that open to expose the technical equipment concealed behind it. Visual trickery makes the room look wider than it is at the forward end where the hull pinches sharply, just before the anchor pocket. From the fishing cockpit, professionally set up with bait tanks, livewells and fitted with a custom fighting chair, whatever fish are not released do not have a long way to go to become lunch or dinner. 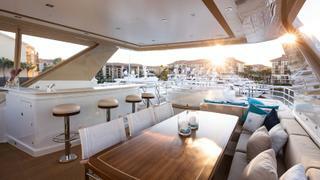 A favourite spot for the owner who loves to grill and fix drinks for guests is the generously sized sundeck. A clear enclosure makes it usable in nearly all weather and with surround sound, for any occasion. Yes, Northland is a custom creation for one owner, but there isn’t much there that would not fit almost everyone’s idea of a good time at sea: a sturdy and safe platform, great tenders to reach secluded beaches, space for a little (or a lot of) fishing, a comfortable and quiet interior, plenty of space to eat, drink and be merry and the ability to go just about anywhere on the planet. Who needs more?